For people who did not grow up here in the desert, that first summer in Greater Phoenix can be somewhat shocking, right? So, below are 3 things (actually, 3 groups of things) to help you prepare for a smooth, safe summer. Plus, the list below is for everyone (even though people who are new to Phoenix summers may benefit most from it). In fact, even if you have lived in Phoenix all your life, some of these may be totally new to you. At the very least, they will be valuable reminders! When I talk with people about things to do every spring for their home, many people have not thought about the topic much. People are usually much more aware of routine maintenance for their auto. For instance, to keep your vehicle safe and efficient, you know several things to do, right? You probably schedule regular oil changes, check tires for wear, and maybe even replace your windshield wipers regularly. Some people even use their scheduled oil changes (around every 3 months) to remind them to change the air filter in their home’s air intake vent. #1) In case you ever need it in a hurry (like for a roof leak or plumbing leak), store our 24-hour number in your phone. #2) Call us to get a roof inspection before the mid-summer rush (especially if your roof hasn’t been inspected lately). In the event of any emergency repairs (whether for a roof leak or a plumbing leak), what would you do? You would want to already have our number saved in your phone! Since a spraying water leak can be very distracting and stressful, you will want to be able to find our number very fast. (In other words, you don’t want to need to remember the name of our company or to need to go online to search for our phone number.) So, here is how you can save it in your phone to be able to find at the very end of your contact list (rather than somewhere in the middle where it will take extra time to find). If your contact list is alphabetical, then the two easiest places to find this number would be at the very top or the very bottom, right? To put it at the very top, just give it the name “A 24-hour #.” To put it at the very bottom, list this as the “first name:” 24-HOUR #. Next, press the + button in the top right to add a new contact. As you can see on the right, in the “company” field, you will type Canyon State Restoration. Then, enter the main phone number: 480-734-5874. That number is answered by a live person 24 hours a day. Once you type in the info and click “done” (in the upper right above), then you will be able to dial us in the event that you need to reach us quickly. Obviously, having our number stored can be important all-year long, although one of our busiest times can be during monsoon season (especially if there is a bad hail storm in Phoenix). If your roof has signs of vulnerability to high winds or water leaks, wouldn’t you want to take care of that prior to the storm season? 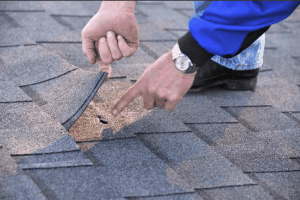 Sometimes, a very small repair will be enough to prevent major damage to your roof. Otherwise, a small weakness can quickly result in lots of leaking water, damage to precious belongings, having to pay your full insurance deductible, plus the noise and inconvenience of replacing your entire roof. While we cannot offer free roof inspections all year long to all of Greater Phoenix, you can ask about any current promotions when you call. If you want both a roof inspection and a service to prevent the most common plumbing leaks, mention this article to qualify for a discount. Call 480-734-5874. Across Phoenix, our expert roof inspectors know how to detect vulnerability in your roof (plus help you file a claim to have high-priority roof repairs covered by your roof warranty or property insurance). To prevent major emergency repair costs, get a roof inspection every single year (especially if your roof has been around for more than half of it’s expected total “lifetime”). Plus, if you don’t know the expected lifetime of your roof, you probably don’t know whether you have a warranty that will only pay for repairs that are done before that warranty expires. Your roof inspector can help you find out if you still have a warranty covering your roof, what the expected remaining lifetime is, plus whether you need any repairs or even re-roofing. On the right above is a roof in greater Phoenix that was so badly damaged during a storm in the summer of 2017 that we had to replace the entire roof. While we are glad to assist in an emergency, preventing major roof damage is what will be best for you. Again, call us at 480-734-5874 to get your questions answered (and to schedule your roof inspection in Phoenix or nearby areas). So, summer temperatures can exceed 120 outside, right? Have you ever noticed how your garage can get MUCH hotter than that? Inside your garage, highs can easily approach 140 (especially right after you park one or two hot vehicles in there in the late afternoon). Plus, if you have ever stood next to metal garage doors while they have been in direct sunlight for a few hours, they can radiate a LOT of heat. If you touch the metal braces on your garage doors even for a moment on a summer, they can definitely burn you. On that same topic, I regularly store the containers for garbage and recycling just inside my garage doors during the winter. During the summer, that turns out to be not such a good idea. The blue container in the picture used to say “Tempe recycles” at the top. Now that melted container needs to be recycled! Did you know that in the Phoenix summer, pavement temperatures can exceed 170 degrees? That is literally hot enough to cook your breakfast! This precaution is not about pavement or cooking though. However, it somewhat related to ovens though…. So, aluminum is not just used when baking potatoes, right? You might not know that it is also a very popular material for garage doors. The next time you replace your garage doors, you might consider a material that does not get scorching hot when in direct sunlight (such as vinyl). That is also a convenient time to order new garage doors that come with factory-installed insulation. Adding a reflective radiant-heat barrier will keep your garage even cooler. However, our primary recommendation here is much simpler than all of that: if you store any cardboard in your garage, put it at least a few feet (or even few yards) away from the garage doors. Why? Cardboard boxes that are too close to hot metal garage doors can be a fire hazard. If any cardboard falls against the scorching metal of aluminum garage doors in the Phoenix summer sun, guess what can happen to the highly-flammable cardboard? By the way, if you have ever seen that a neighbor leaves their garage door raised a few inches off of the ground during the summer, that is to allow for some air circulation. That way, instead of your garage being an enclosed oven, the super-heated air inside your garage can vent out. Also, in recent years, more homes have garages with windows or even air-conditioning. If you are interested in any home improvements (for your garage or anything else), call our main phone number and leave a message for our renovation estimator. To clarify, although Canyon State Restoration specializes in damage repairs, our company operates under a general contracting license (and our staff is experienced with a variety of remodeling and construction projects). So, if you did not already store our number in your phone, go ahead and do that before you call: 480-734-5874. Just above, we focused a lot on how your garage can be like an oven in the summer. Related to that, here are two final precautions that are simply more convenient to do in the spring than in the summer. Tucked in the corner of many garages in Phoenix is a hot water heater. While morning temperatures are still in the lower 80s, the precaution mentioned here will be a lot more pleasant to do. You might not know that the water in the Phoenix area contains a lot of minerals and salts that can clog up all sorts of plumbing, including your water heater. So, draining your water heater once or even twice a year can greatly increase the lifetime of your water heater (plus increase your water pressure). Most importantly (when it comes to preventing leaks and water damage), if you keep the sediment from building up, then that will reduce the chances of a leaking water heater. In the photo on the left above, notice that the water heater has flakes of sediment, plus numerous rust spots from water leaks, plus the paint on the wall is bubbling from the leaked water. If your water heater looks anything like that, call us immediately. As for draining your water heater yourself, it can be simple to do (usually). Very important is to be careful of the safety issues with very hot water. Even in the winter, the water in your hot water heater is supposed to be kept close to scalding hot, right? So, you don’t want to drain it yourself unless you know the steps to do it safely and avoid burns! Still, do make sure that it gets drained regularly. If you do not know how to drain your water heater safely, call us at the number below and we will send an expert to do it for you. We offer Phoenix residents an inexpensive service that will greatly reduce the chances of a flood in your home from a plumbing leak. Just like you will eventually need to replace the tires on your car (or replace your water heater or roof), there are lots of small items in your home that either will be replaced before they fail and cause a leak… or after they fail and cause a leak. We recommend that you save yourself the time and trouble of even minor water damage by having one of our plumbers take some preventive measures every year. He will check all the most common locations of hidden leaks. (That includes the plumbing in your bathrooms, plumbing in your kitchen like your refrigerator water line, your connections for your washing machine, and much more). Unfortunately, your home’s plumbing is full of small parts that are only reliable for five to ten years (or even less). The older your home, the more likely it is that you do not have any steel-braided hoses, which are the best for preventing the worst leaks. Also, because it is so dry and hot here, rubber washers that usually last decades in most of the US often don’t last nearly so long here. They can quickly warp or crack (causing slow hidden leaks that can result in drips, mold, and rot). Fortunately, our annual maintenance service typically takes very little time. It includes the cost of inspecting and replacing several of the plumbing components that most frequently fail. Our plumbing experts can even drain your water heater for you safely (although at a small additional cost). What is the best way to schedule your service today? Simply call us at 480-734-5874!